1. Login into Amazon web service console. 2. Go to Services -> Click on IAM. 4. Click on “Create New Users”. 5. 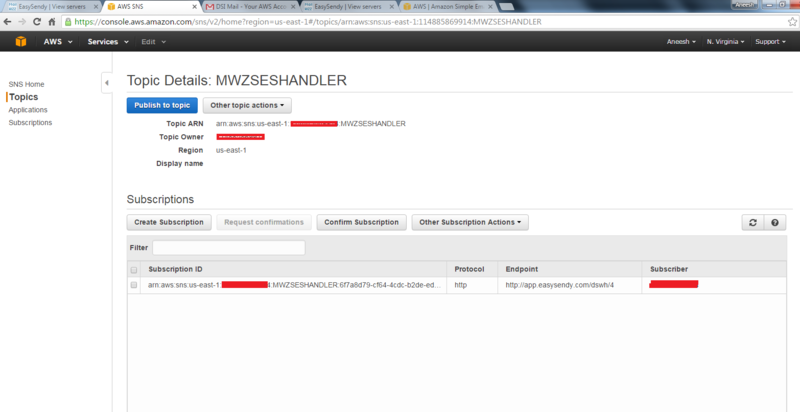 Enter username as “easysendypro” and choose “Programmatic access” and click on “Next Permission” button. 6. On the next screen choose “Attach existing policies directly” and then select checkbox for “PoweruserAccess” under Attach Policy and click on “Next Review”. 8. Go to Easysendy, go to “Servers” and click on “Create New Server”. 9. Select “Amazon Ses Web Api”. 10. Enter Name “Amazon SES” and paste the “Access Key ID” from Amazon as username. 11. Go to Amazon console and copy “Secret Access Key”. 12. Go to “Easysendy” and Paste “Secret Access Key” as “Password” . 13. Go to “Service -> Simple Email Service -> Email Addresses”. 14. Click on “Verify a new Email Address” button. 15. Enter “Email address” and click on “Verify This Email Address”. 16. Go to Email and open the email. 17. Click on the link for Verify. 19. The status changed as “Verified”. 20. In the EasySendy Drip (or EasySendy Pro) Application Dashboard, Select the region in which you have verified your email in your Amazon SES account. 21. Enter the below listed details. a. “From Email” – Enter the from email ID. f. “Reply-To-Email” – Enter the reply to email ID. g. “Force Reply-To” – Select the condition for “Force Reply-To” (Default – Never). 28. Click on “Save Changes”. 22. Enter the “Email ID” and click on “Validate Server” button. 23. Go to Email and open the email. 24. Click on “Verification Link”. 25. The “Status” will change to “Active”. 27. Click on “Services -> SNS”. 29. Click on “ARN” link”. 30. The endpoint will display as “http://app.easysendy.com/…/…”. 31. To check the given webhooks/endpoint inside EasySendy Drip (or EasySendy Pro) account, go to delivery server > edit the server > click on “Info” tab from the right corner of the screen. 32. In the new pop-up box, you will get the details about how to setup the webhooks and the EasySendy Drip (or EasySendy Pro) links.